Here at RealtimeBoard we set out on a mission to help team-driven companies turn the challenges of distributed work into competitive advantages. However, these challenges are not exclusive to teams that think of themselves as distributed. As soon as you leave a meeting room, you also need these tools to digitally share your ideas; even colocated teams practice remote collaboration from time to time. RealtimeBoard helps teams collaborate beyond locations and time zones – not only opposite parts of the world, but also within the same building or even a shared room. This is why RealtimeBoard has released a set of features that improve the real-time experience during offline or ‘combined’ meetings. 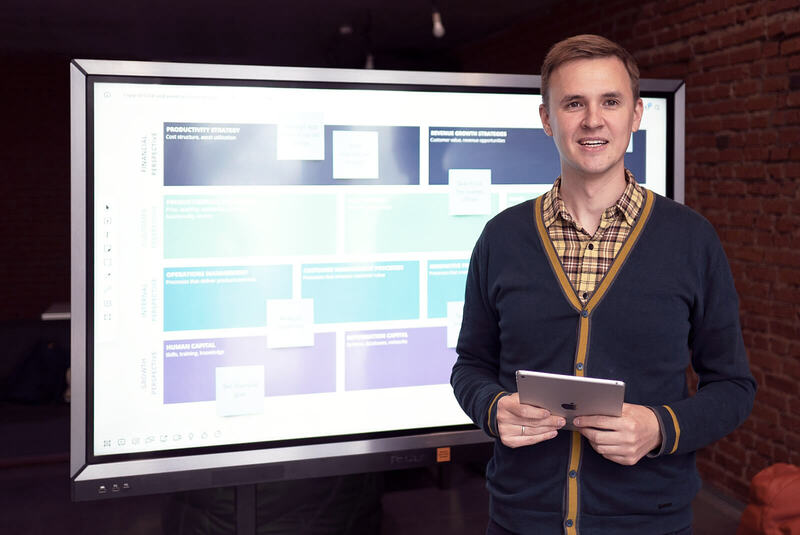 Here are some RealtimeBoard features that will help your team digitally capture physical artifacts and improve collaboration. Teams have to document and digitize their meetings. According to some of our customers, it can take two hours or more to write down all the ideas after a workshop. It’s often challenging to transfer the structure you created on a whiteboard into a digital format, because existing tools aren’t suited to creating visual systems. The RealtimeBoard app is the easiest way to keep, edit, and share stickers after brainstorming, story mapping, or Retrospective sessions. You can extend their life beyond the meeting and never waste time rewriting stickers after the meeting is over! 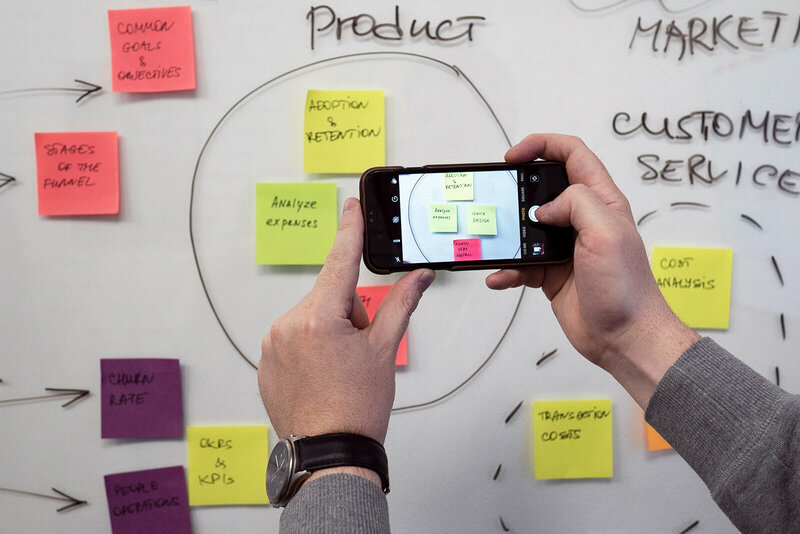 Simply take a picture of the sticky notes, and our app will recognize them as digital stickers with your content. No matter how powerful your product team may consider a web whiteboard, if you are colocated, the person leading the meeting will probably offer a regular whiteboard. 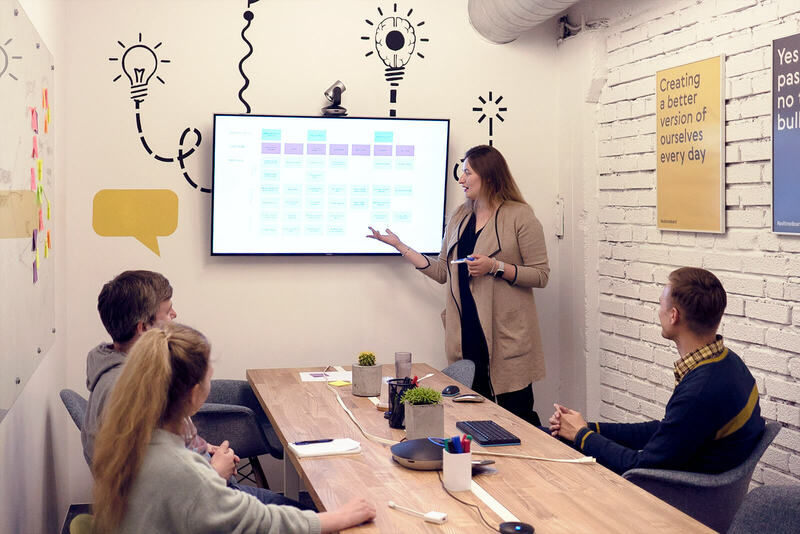 It’s true that a board on the wall is more engaging, but it doesn’t have all the time-saving benefits of a digital solution, such as the ability to convert stickers into Jira tasks. 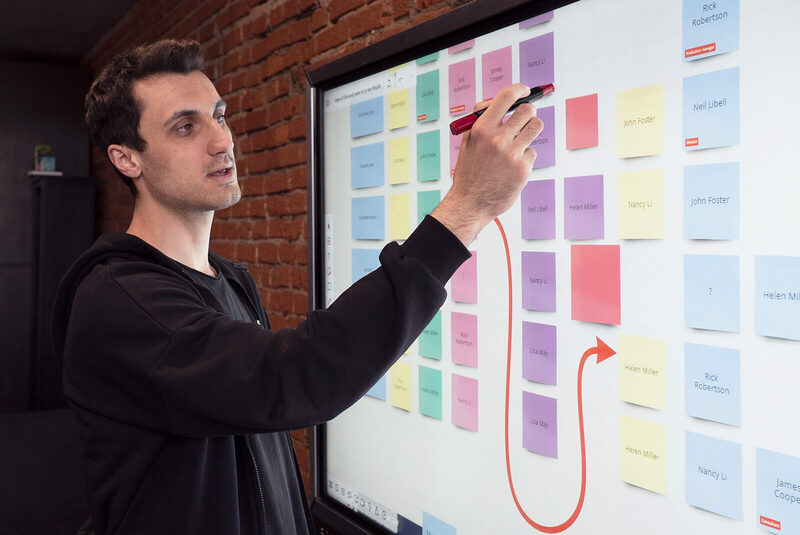 With a special mode developed for big touchscreens, RealtimeBoard combines all the benefits of physical and digital whiteboards. The combination of a powerful device and leading software makes thinking outside the box not just a metaphor, but a real process that everyone can experience. This navigation mode is intuitive and turns on as soon as you enter the board on a touchscreen device. A paper prototype is one of the fastest ways to explain your idea to the team when you’re short of time. 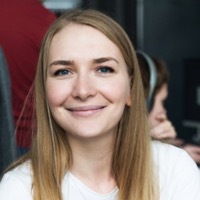 However, not every team member is good at drawing quickly, so people often resort to more time-consuming digital solutions to build low-fidelity prototypes out of the simple blocks. Your team can organize design workshops and collaborate live with Smart drawing mode in RealtimeBoard. You don’t have to worry about how it looks – this mode automatically converts your drawings into accurate shapes, sticky notes and connection lines. You just need to arrange them on the board later. You might have spent months on a project, accumulating a significant number of files. In the end, you need to allocate even more working hours just to copy and paste the results or insights into a presentation in a separate tool. RealtimeBoard is an infinite digital whiteboard, so you can store all your project documentation, designs, insights, and logic visually in one place – on a canvas. And it just takes a few minutes to turn a whiteboard with all the files you’re working on into a presentation. With our special Presentation mode, you just need to cut the board content by frames in a particular order. Then you can either show the board with smooth transitions between frames or present them in full screen as you play slides in a regular presentation solution. Same output with no duplicating work, no switching between tools, and various editing access options for the rest of your team. Full Disclosure: This article is sponsored by RealtimeBoard.